Sharing a bedroom is not so bad when you have this black metal twin-full bunk bed frame around. This handsome, contemporary bed fits well in a modern bedroom or dorm room scheme, thanks to its sleek black finish and clean lines. The top bunk accommodates a single sleeper, while one to two kids can sleep on the full-size bottom bunk. Side ladders allow fast access for the top sleeper, while a guardrail prevents accidental falls. Two-inch tubular construction adds durability and sturdiness to the design, making it ideal for rough-and-tumble kids, tweens, or teens. 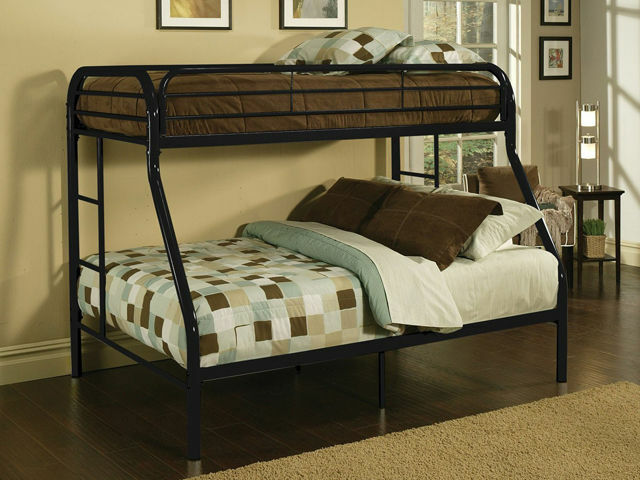 Accommodate up to three sleepers with this black metal twin-full bunk bed frame.